Mystery novelist Phyllis Dorothy James, Baroness James of Holland Park, better known as P. D. James, died on 27 November 2014 at the age of 94. 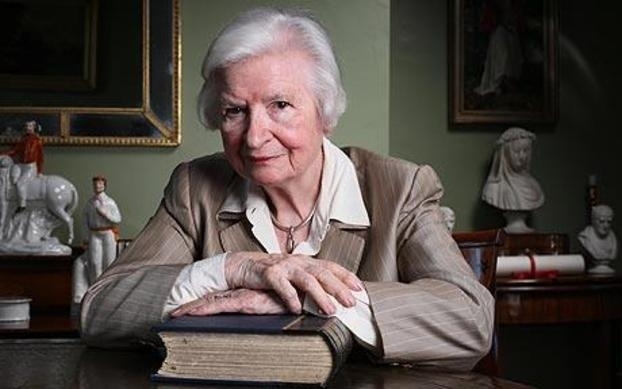 P. D. James was born in Oxford on 3 August 1920. She attended the British School in Ludlow and Cambridge High School for Girls. She was unable to go to university because she could not afford to do so. She went to work in a tax office after leaving school. When she was 21 she married Earnest Connor Bantry White. Her husband served in the Royal Army Medical Corps during World War II. Unfortunately after the war he suffered from schizophrenia so severely that he spent much of his time in hospital. To support the family P. D. James studied hospital administration and began working for the National Health Service in 1948. She continued to work for the NHS until 1968. Afterwards she worked for the Home Office until 1979, most of that time spent in the Criminal Policy Department. P. D. James's first novel, Cover Her Face, was published in 1962. It was the first in what would be a series of 14 novels featuring Detective Chief Inspector (and eventually Commander) Adam Dalgliesh of New Scotland Yard. The Adam Dalgliesh novels would prove to be extremely popular. Starting in 1983 the first novels in the series would be adapted by by Anglia Television for ITV. These adaptations starred Roy Marsden as Dalgliesh. The BBC adapted the novels Death in Holy Orders and The Murder Room in 2003 and 2005 respectively. In the films Martin Shaw played Dalgliesh. The final Adam Dalgliesh novel, The Private Patient, was published in 2008. She also wrote other books than those in the Adam Dalgliesh series. She wrote two novels featuring London private detective Cordelia Gray. The first, An Unsuitable Job for a Woman, was published in 1972. The second, The Skull Beneath the Skin, was published in 1982. Helen Baxendale played Cordelia Gray in the ITV series An Unsuitable Job for a Woman that aired on and off from 1997 to 2001. P. D. James also wrote novels outside the mystery genre. Her 1992 novel Children of Men was dystopian science fiction set in a futuristic England where infertility has occurred on a massive scale. It was adapted as the film Children of Men (2006) by director Alfonso Cuarón. She also wrote a continuation of Jane Austen's Pride and Prejudice that places Austen's characters in a murder mystery, Death Comes to Pemberley. Death Comes to Pemberley was adapted as a three part serial by BBC One in 2013. P.D. James was one of the most influential mystery writers of her time, and also one of the greatest as well. P. D. James continued the tradition of the gentleman detective with Adam Dalgliesh and her mysteries were very much in the tradition of Agatha Christie and Sir Arthur Conan Doyle. At the same time, however, she brought the gentleman detective into the late 20th Century. Her novels not only featured complex characters, but often dealt with such modern problems as child abuse, drugs, and even radiation poisoning. Ultimately P.D. James was much more than a writer carrying on the tradition of such writers Agatha Christie and Dorothy L. Sayers. Quite simply, she took the gentleman detective mystery where it had never gone before. There was perhaps no more famous (or notorious) set of sisters in the 20th Century than the Mitford sisters. The daughters of David Freeman-Mitford, 2nd Baron Redesdale and Sydney Bowles, the Mitford sisters ranged from a celebrated beauty who married a British Fascist leader to a Communist who became a celebrated journalist and activist in the United States to a beloved duchess who was largely responsible for saving her husband's estate. While all of the Mitford sisters would attain some degree of fame (and, in some instances, infamy), perhaps the most famous of the sisters was also the eldest. Nancy Mitford would attain lasting fame as a novelist, biographer, and journalist. 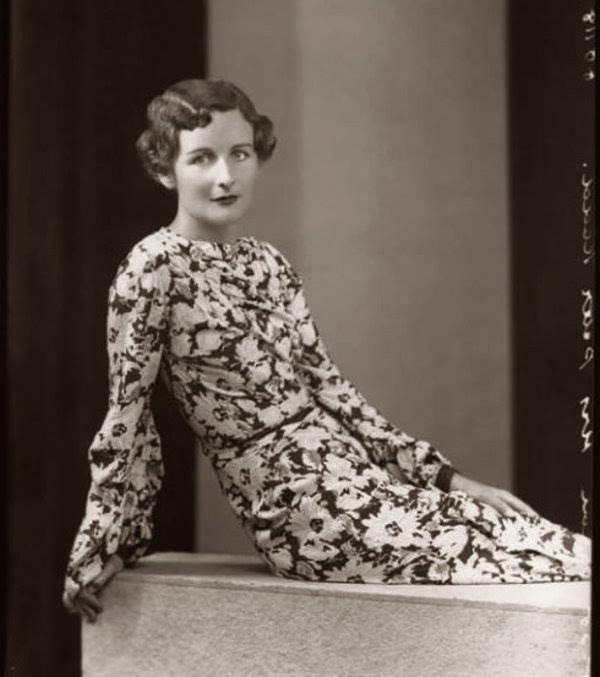 It was 110 years ago today that Nancy Mitford was born in London. In many respects there was little wonder that Nancy Mitford should have a literary career. On her father's side she was descended from historian and author William Mitford as well as diplomat and author Algernon Freeman-Mitford, 1st Baron Redesdale (her grandfather). On her mother's side her grandfather was Thomas Gibson Bowles, journalist and founder of both the British Vanity Fair and The Lady. To say "writing is in one's blood" may be a bit of a cliché, but in the case of Nancy Mitford it might well have been true. Nancy Mitford began her writing career in the late Twenties, writing short, anonymous pieces of gossip for the various society magazines. She soon moved onto writing articles for which she received a byline in magazines such as Vogue. It was in 1930 that she started writing weekly columns for the magazine that her maternal grandfather had founded, The Lady. While Miss Mitford made a nice amount of money writing articles, she had greater aspirations when it came to writing. Her first novel, Highland Fling, was published in 1931. Nancy Mitford followed Highland Fling with Christmas Pudding in 1932, Wigs on the Green in 1935, and Pigeon Pie in 1940 before finding enormous success with The Pursuit of Love in 1945. The Pursuit of Love proved to be an international best seller. Nancy Mitford followed it with a companion novel, Love in a Cold Climate, in 1949. It proved equally successful. She followed the success of The Pursuit of Love and Love in a Cold Climate with The Blessing in 1951 and her final novel, Don't Tell Alfred, in 1960. It was after Nancy Mitford had established herself as a best selling novelist that she also established herself as a biographer. Her first biography, Madame de Pompadour (about Jeanne Antoinette Poisson, Marquise de Pompadour), was published in 1954. It was followed by Voltaire in Love (dealing with the love affair between Voltaire and the Marquise du Châtele) in 1957, The Sun King (dealing with Louis XIV) in 1966, and Frederick the Great in 1970. Miss Mitford wrote her biographies with much the same tone as her fiction, writing them as much to entertain as to educate. Like her later novels, her biographies also proved successful. While Nancy Mitford's novels may have been her greatest claim to fame and her biographies remain popular, for many she may be best known for an essay "The English Aristocracy", first published in the magazine Encounter in 1954 and later published in the collection Noblesse Oblige: An Enquiry Into the Identifiable Characteristics of the English Aristocracy. "The English Aristocracy" was largely a Mitford tease, complete with a discussion of "U" (upper class) and "Non-U" (non-upper class or the lower classes) speech. Nancy Mitford did not invent the terms "U" and "Non-U" to denote the social dialects of Great Britain. It was British linguist Alan S. C. Ross, Professor of Linguistics in the University of Birmingham, who coined the terms in 1954 in his article "Linguistic Class-Indicators in Present Day English". Despite this Nancy Mitford would become the person most associated with the terms "U and Non-U". In fact, there were many who did not apparently get Miss Mitford's joke and the article stirred a bit of controversy with regards to the classes in Great Britain. There were even those who regarded Miss Mitford as an authority on the aristocracy, an insufferable snob, or both. While many today know that Nancy Mitford meant "The English Aristocracy" as a tease, she remains the person most closely associated with "U" and "Non-U" speech in most people's minds. One hundred ten years after her birth Nancy Mitford remains one of the most popular authors to emerge from mid-20th Century Britain. Her works have even been adapted to film and television. Her novel The Blessing provided the basis for the 1959 comedy film Count Your Blessings. Her novels Pursuit of Love and Love in a Cold Climate were adapted as the 1980 Thames Television mini-series Love in a Cold Climate. In 2003 The Pursuit of Love was included in a list of "The 100 Greatest Novels of All Time" published in The Guardian. Uncle Matthew from The Pursuit of Love and Love in a Cold Climate was included in a list of the "Best Fictional Characters" published in The Independent in 2014. If Nancy Mitford is still popular, it is perhaps because she was an immensely talented writer. She possessed a razor sharp wit which she put to good use in both her non-fiction articles and her novels. Although she has been accused of being an aristocratic snob, her novels are satires of the upper class. Particularly in The Pursuit of Love and Love in a Cold Climate, Miss Mitford was always one to point out the absurdities of the aristocracy. The aristocracy were not the only targets of Nancy Mitford's satire. In Highland Fling and Christmas Pudding she sent up the Bright Young Things of her own generation. In Wigs on the Green she satirised the British Fascists so savagely that it created a rift between Nancy and her sister Diana (who was involved with and would later marry Sir Oswald Mosley, leader of the British Fascist Union). Short of her friend Evelyn Waugh, no British writer was as good at satire as Nancy Mitford was. Of course, much of Nancy Mitford's success as a writer is also due to both her fiction and non-fiction being very readable. Even in her biographies Miss Mitford used a conversational style with a good deal of wit. None of her writing, from her articles to her novels to her biographies could ever be described as "dry" or "boring". She was also capable of creating very memorable characters. I suspect very few people who have read The Pursuit of Love and Love in a Cold Climate will ever forget Uncle Matthew. As a writer Nancy Mitford was a unique combination of biting satire and readable prose that was easily adaptable to either fiction or non-fiction. It is little wonder that 110 years after her birth she continues to be popular. I just wanted to wish my fellow Americans a happy Thanksgiving! It is my custom here at A Shroud of Thoughts to post vintage pinups every Thanksgiving. Here then are this year's pin ups! 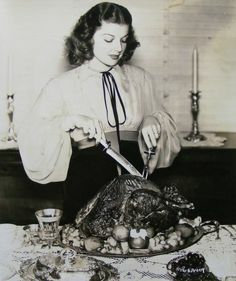 Ann Sheridan carving her turkey. 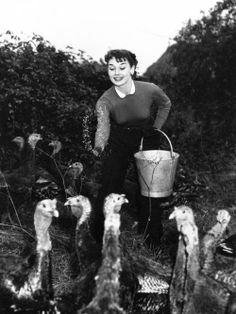 Audrey Hepburn prefers feeding the turkeys to eating them. 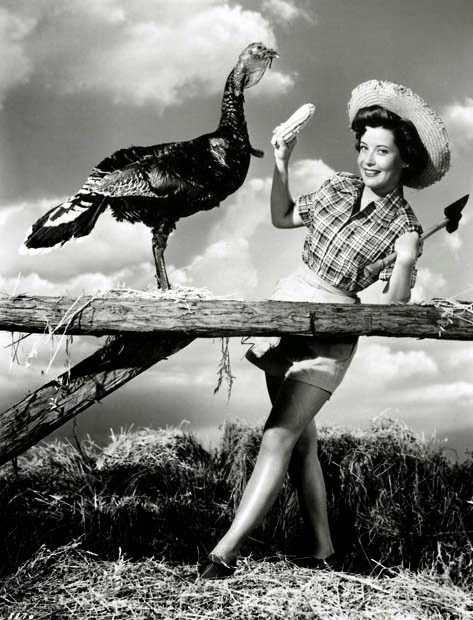 Gloria De Haven offers the turkey some corn. 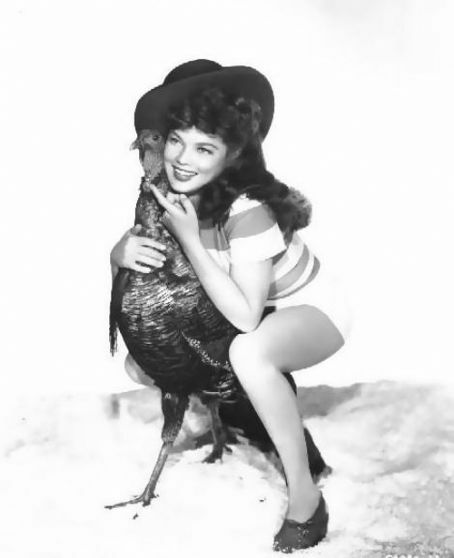 Dona Drake prefers to hugging the turkey to eating him. Virginia Dale also prefers hugging turkeys to eating them! If you're a regular reader of this blog you might also be familiar with the classic film blog Out of the Past. Well, today is the birthday of Quelle, who has run that blog for the past seven years. Out of the Past was one of the first classic film blogs I started reading and Quelle was one of the first classic film bloggers I befriended. She was the first person I ever followed on Twitter. In her blog she writes about a variety of film related topics, from films noirs to classic film stars. She regularly includes reviews of classic film related books. Quelle is the one of the most wonderful people I know and you would do well to read her blog! 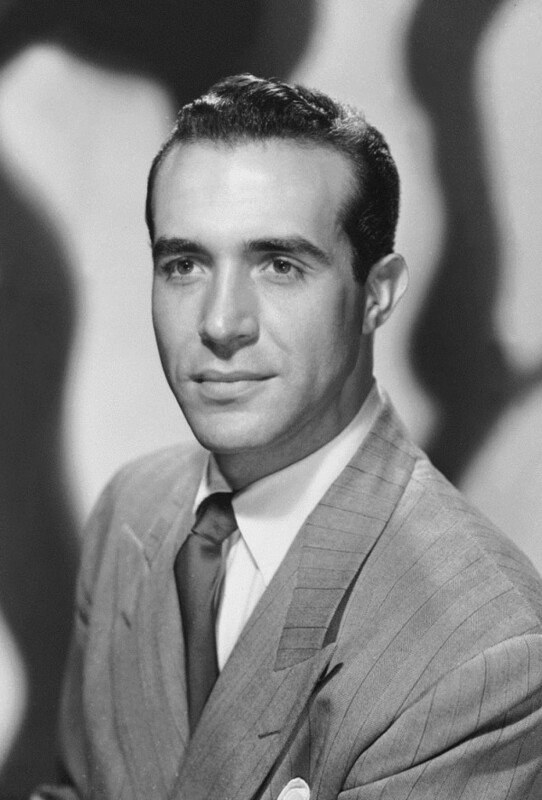 Quelle shares her birthday with some other cool people, among them Ricardo Montalbán, who is one of my favourite actors of all time. 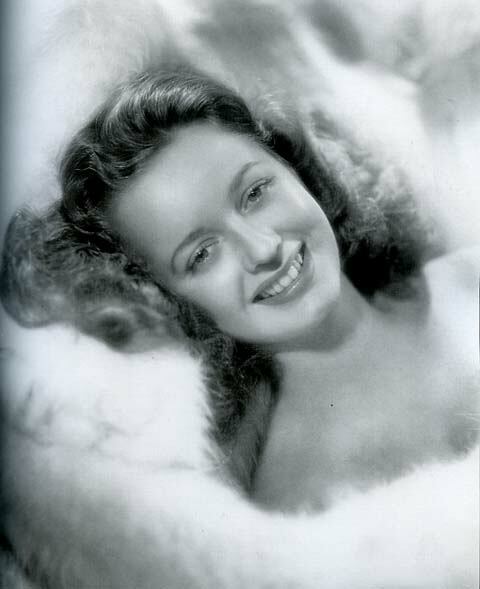 She also shares her birthday with Noel Neill, the first actress to play Lois Lane in a live action film (the serial Superman)! Quelle even shares her birthday with the original captain of the starship Enterprise! 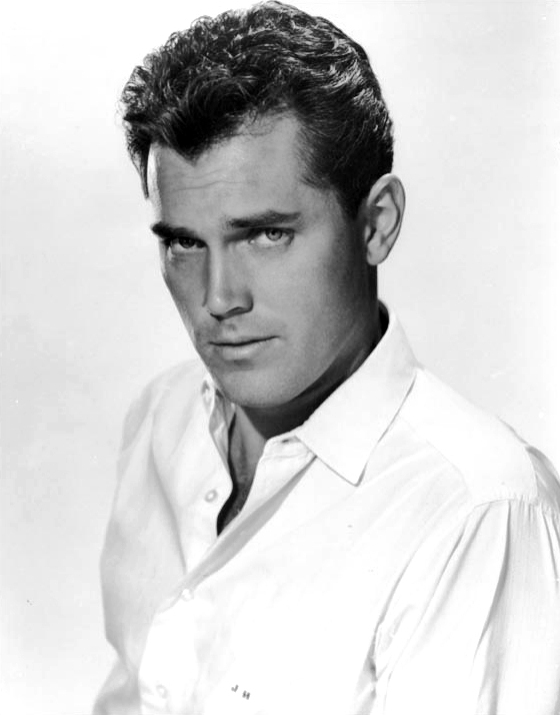 Jeffrey Hunter played Captain Christopher Pike in the pilot for the TV show Star Trek, "The Cage", shot about a year before William Shatner assumed the role of Captain Kirk! It seems that a lot of cool people were born on November 25, and Quelle is among the coolest of them. Here's wishing Quelle a very happy birthday!